Seongbukdong is one of those neighborhoods vastly overlooked by Seoul's visitors and locals alike but worth exploring for its rich history and charming atmosphere. In recent years its quieter environment and the (comparatively) cheaper real estate has attracted younger entrepreneurs to set up a few restaurants, bars, and cares around here joining quite a few long-running restaurants. One of those restaurants with pedigree is today's place. Seonbukdong Maemil Sujei Nurungji Baeksook (what a mouthful) is actually a recently renamed restaurant though it has long been serving its star dish of nurungji baeksook for a while. Baeksook is a traditional dish in which a whole chicken is slowly cooked, often in one of those big traditional cauldrons, with simple seasonings and ingredients to produce a fall-apart tender chicken that also leaves behind a nutritious and tasty simple broth. Here, the twist is that the broth comes with cooked nurungji, or browned/toasted rice. And if you thought that the addition of nurungji to chicken soup is a menial addition, you are deeply mistaken. It's not difficult to recognize this restaurant from the outside as you'll see parking valets running about the long line of vehicles. 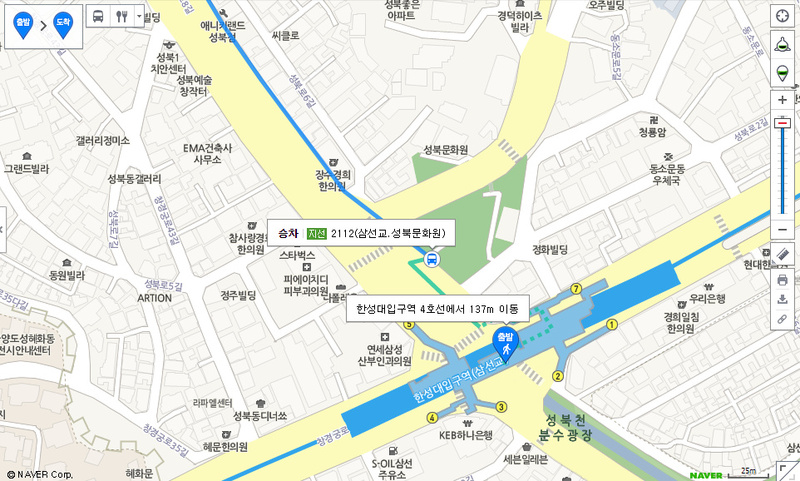 This is actually not uncommon with many restaurants in the vicinity as, for all of Seongbukdong's charms, it's not quite an accessible neighborhood with only a handful of buses that runs through the area. Thus, most locals tend to take their cars to the restaurants around here. Spacious seating but it gets crowded quite fast, especially during peak lunch and dinner hours when lines are not uncommon. The introduction to their menu talks about how their buckwheat (maemil) comes from Gangwondo's Bongpyeong region which is traditionally known for its maemil. The menu also states that their cabbage, rice, chicken, and red chili powder are all locally sourced. Their most popular menu item, and from which the restaurant partially draws its name from, is the nurungji baeksook. This dish actually is sold in a set where you get the big platter of chicken that's stuffed and cooked in a cauldron, the soup with the toasted rice added to it, and served with a platter of the cooked-to-order maemil jeon or savory pancake made from buckwheat. While the English description simply states that it's "boiled chicken" the Korean description describes what a laborious dish it actually is. After cleaning and prepping the whole chicken, it's stuffed with ginseng, chestnuts, jujubes, pine nuts, garlic cloves and other ingredients and cooked just right in a iron cauldron until the chicken is perfectly cooked and tender. The sticky rice on the bottom forms a bit of toasted rice that sops up the nutritious chicken broth. But chicken isn't the only focus of this restaurant as buckwheat (maemil) plays a central role in their dishes. These include the wild perilla seed maemil sujebi (8K), the broth which is made with anchovies and radish and joined with vegetables, maemil sujebi, and wild perilla seeds for a light yet filling (the menu says it's good for those on a diet) dish. The maemil jeon (9K) in which the maemil is ground finely and sifted before being made into a batter that's given time to rest to come together before being seasoned naturally and cooked fresh to order. The menu also highlights how this was a dish that was traditionally served in the royal palace. Their maemil sujebi with manila clams (8K) is described as having a homemade broth, using fresh seafood, in which vegetables like squash, potatoes, and the maemil sujebi come together in. Maemil bibimguksu (8K). In which maemil noodles are handmade with a high maemil content and rested before being cooked. It's then served with buckwheat sprouts and other vegetables in a seasoning that uses some 20 ingredients for a refreshing and healthy dish. And maemil bibimbap (8K) in which cooked buckwheat rice is joined with seasonal vegetables and also ingredients like nutty soybean powder and toasted seaweed for a different take on bibimbap. As the menu description shows, a strong focus of this restaurant is in healthy dishes and they repeatedly emphasize how their food can be enjoyed by those of all ages. This is also a great option for those who are vegetarian as dishes like the maemil bibimbap, maemil jeon, and maemil bibimguksu are vegetarian friendly while pescatarian options include the wild perilla seed maemil sujebi and seafood maemil sujebi. Sides are simple with kimchi, kkakdugi, dongchimi, and some cucumbers and peppers with ssamjang. The menu stated that the kimchi rotates seasonally and I can tell you this is an excellent sign of a true Korean restaurant as normally the variety of kimchi Koreans eat depends on the time of year (e.g. yeolmu kimchi in late spring or dongchimi in winter). On our visit, we ordered the nurungji baeksook and maemil jeon set and added orders of the wild perilla seed maemil sujebi and the maemil sujebi with manila clams. First came the sides. Roasted sea salt and pepper for the chicken. As a sort of appetizer, the maemil jeon is first to come out. Made with ground maemil, or buckwheat, the crepe-thin jeon comes conveniently cut into slices for you and adorned simply with some dolnamul- an edible plant known in English as sedum- some buckwheat shoots, and a bit of chogochujang drizzled atop the greens. The recommended way to eat is to take a slice and place a couple of the sedum and buckwheat shoots atop it. Then roll it up and dip in the soy sauce. The initial layer of slightly nutty buckwheat base gives way to the fresh and vibrant scents of the greens and is an all-around great way to awaken your taste buds. Their experience in making the jeon is evident by the perfect, golden-brown pan frying with the jeon not being the slightest bit greasy. Because we had a large group, in addition to the set, we also ordered the maemil deulkkae sujebi, or buckwheat sujebi (little bits of boiled dough pieces) in wild perilla seeds soup, and the bajirak maemil sujebi, or buckwheat sujebi in manila clams soup. Both bowls of sujebi are quite large and shareable as add-ons to the nurungji baeksook. Ground wild perilla seeds adds a thick texture to any soup it's added to and swimming within this soup are the pieces of sujebi and some chopped vegetables. The flavors of wild perilla seeds are hard to describe for someone who hasn't had it before. It has a much more grounded, earthy element to it than regular sesame seeds and a more complex profile. I think the closest I can compare this version is like a ground pine nut soup. Savory but with a earthy and almost creamy flavor to it. There are some who aren't the biggest fans of wild perilla seeds but if you like brown rice or whole wheat bread, that's the closest comparison I can make over the white rice/bread counterparts. If you'd rather enjoy the sujebi in a simpler state, the haemul sujebi will probably be more to your liking. The broth here is clear, made simply with clams, anchovies, and other goods, for a deep yet clean taste. It's a better option to really enjoy the maemil sujebi which are delightfully chewy with each bite releasing more of the maemil's grounded nuttiness. Little children will enjoy this dish as well. The restaurant's most popular dish, the nurungji baeksook, is served in a multi-tiered fashion and is guaranteed to take everyone's attention at the table. At the bottom layer is the small earthenware pot that's filled with the nurungji and chicken broth. Atop it is a large plate in which the whole, cooked chicken is served on- still steaming hot and wafting its delicious scent everywhere. The recommended way of eating this dish is to eat the chicken first. Because of the expert cooking of the chicken, the poultry is just fall-apart tender and you can easily rip the chicken into its different cuts making it easy for individuals to pick the cuts he or she has a preference for. As stated, the chicken is stuffed, similarly to the popular samgyetang, with goods like garlic, pine nuts, ginseng, etc, which can be unearthed like little gold nuggets, when you start digging in.These ingredients aren't thrown in by random and in addition to adding nutrients, they act to remove the potentially gamy scents from the meat and the chicken here is just pure, wholesome goodness. With your cut of chicken on your plate, shred some of the chicken meat, dip it lightly in the sea salt and pepper and enjoy this simple yet comforting dish. This is a great dish for families with diverse age groups as the elderly, young, and adults will all be able to enjoy without complaints (be mindful of the chicken bones of course). And at the tail end of your meal, the nurungji is to be enjoyed. If you've had the cooked sticky rice inside a samgyetang before you'll know what a treat this is but the straightforward additional step this restaurant takes in making the rice into a toasted nurungji adds a whole different dimension of flavor to this porridge dish. For comparison, think about the added flavor profile bread that has simply been toasted adds to any dish and this is what you can think of. And the fact each toasted rice kernel has soaked up that nutrient rich broth will encourage you to dig in to the last drop. With an emphasis on fresh, healthy dishes this is one of those restaurant's that will nourish your body, soul, and mind. No corners are cut in the ingredients used, prepping and cooking of the dishes and the food is versatile enough to cater to all ages, backgrounds, and for almost all dietary restrictions. The nurungji baeksook is not to be missed. Service can be off a bit because of how busy it is and the location isn't the best for visitors but if you're exploring the area, it's worth visiting. Just try and avoid peak lunch and dinner times, particularly on weekends. 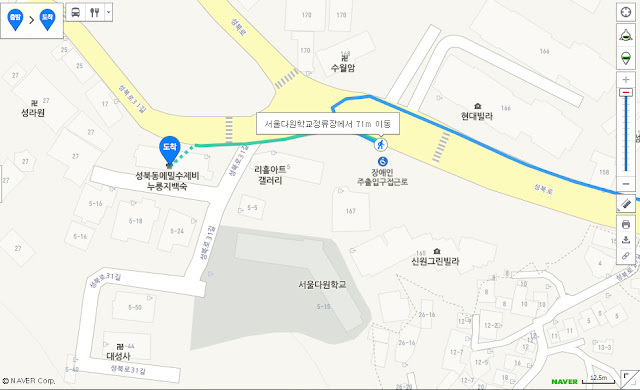 Seongbukdong Maemil Sujebi Nurungji Baeksook is about 2km away from the closest subway station but here's how to get there. 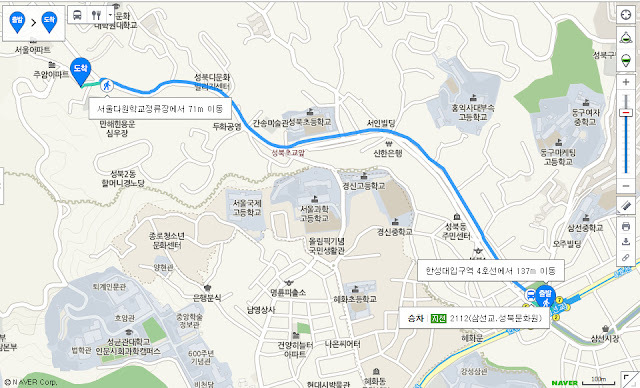 Walk straight out from exit 6 of Hansung University station (of the #4 blue line) and you should see a bus stop almost immediately (the bus stop name is Samseon Bridge, Seonbuk Cultural Center stop or 삼선교.성북문화원). From here, board either bus #2112 or #1111. After 8 stops, get off at Seoul Dawon School bus stop (서울다원학교). 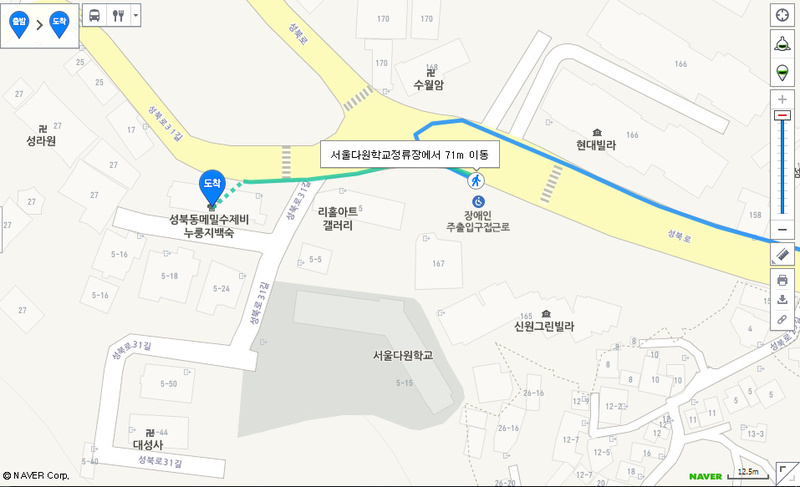 Walk about 70 meters west along Seongbuk-ro 31gil and you will see the restaurant on your left. This is a popular restaurant so try and avoid peak lunch and dinner hours. Somewhat randomly, the restaurant owners operates a wonderful vintage LP (vinyl record) cafe on its third floor called Rhee Hall. In this spacious cafe, with excellent audio equipment, are more than 80,000 different vinyl records the owner has amassed over the years. The records range in everything from classical to old classics, jazz to pop. There is a 10K per person admission fee for this cafe but if you bring the receipt from your dining at the restaurant on the same day, your group can enter for free (this was a policy as of the beginning of 2017 but check to make sure it's still going on). You're still expected to purchase a beverage (illy coffee, tea, and other drinks available) but you can also make song requests which they will play for you. It's quite a wonderful setting and you don't need to travel far if you're looking for coffee/tea after your meal anyways!